So I inadvertently took a blogging hiatus last week and it was all because I lost the power cord to my MacBook. I had it the week before as I wrote the five for friday post but it seemed to be mia. 95% of the time, my blogging is done at my MacBook at the built in desk in my kitchen that I hate but thats a whole other story. The other 5% is done in my bedroom watching TV or in our bonus room watching TV. I don't like blogging on my iPhone or iPad and our desktop iMac is so slow that it is used strictly for me uploading all my photos into iPhoto which is then backed up online Backblaze. So using that was out of the question too. I searched everywhere for it before finding it in Penelope's room when I was purging her room late Wednesday morning. I had planned to catch up that night but my week got crazy and I lacked sleep and gave up for the week on my blog. Hopefully I can catch up on all lost blog posts haha. So Wednesday night Penelope had soccer practice until 7pm and then her + Greg went to the library before coming home and she got ready for bed. She is usually pretty tired on Wednesday's after a full day of school and soccer practice and goes right to sleep. She did this night too but at about 2:45am she woke up crying. At first I thought it was a bad dream because it is not unusual for her to have dreams where she is very vocal in her sleep. Usually she will do it for a few minutes and then I will say something to her and there is no response which is how I know it is just a vivid dream. This time she responded that her thumb hurt. Greg said that he didn't recall her thumb being jammed at soccer or anything so I went and looked and it was a little red but nothing jumped out at me. She whined about it for about another hour before falling asleep until I woke her up at 730am. When I looked at that morning, it looked a little swollen and I just assumed she chewed her nail to closely to the skin and that if she quit chewing her nails she would be fine. She went to school and made no mention of her thumb for the remainder of the day and into the evening. We put her to bed and she was asleep instantly we thought but it turned out she had her iPad in her room. We found that out she had it when we heard her giggle. I went and took it away and as soon as I got it and put it on my dresser, she started crying about her thumb. It still looked normal to us so we kinda ignored it but she would not quit crying. Greg went and got some tylenol to help with the pain and I checked hospital wait times since urgent care closed at 10pm but the waits were upwards of 4 hours and lets face it, a thumb injury isn't much of an emergency and I knew we would wait all night to be seen no matter which hospital I chose. And Penelope hates hospitals we found out that night too. That might be because on Thursday morning Greg told her that if she didn't quit chewing her thumb, the doctor would cut her thumb off. This did not make her or i happy. So being the bad mom that I am, I tried to bribe her to be quiet with threats of taking her to the hospital and it kinda worked. She would sleep and then cry and then sleep and then cry and this continued until about 5am where finally fell asleep until just after 7. 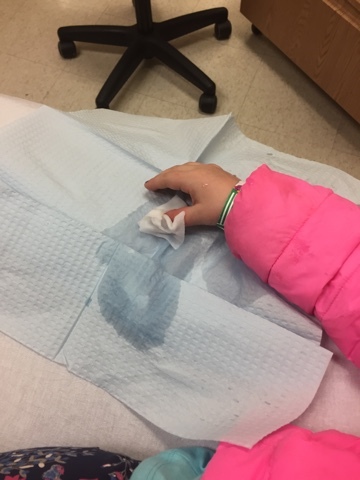 This is what I saw when I looked at her thumb when she woke up and I was horrified and legit felt like the worst mom in the world but that being said, I have zero regrets about taking her to the hospital in the middle of the night. 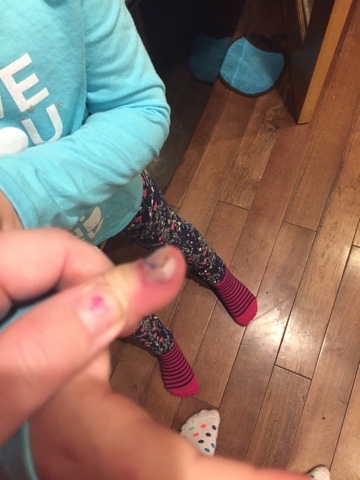 You can't really see in this photo but basically her thumb was swollen 2x the size that it should be and it was black and purple all around her thumb with a huge bubble on the outside of it. I panicked and got Greg to stay home later so he could take Finley to school so I could take Penelope to urgent care when it opened at 8am. We got into the urgent care right at 8am and we were about 4th in line which wasn't too bad. The website was saying 30 minute wait but I was ok with that. 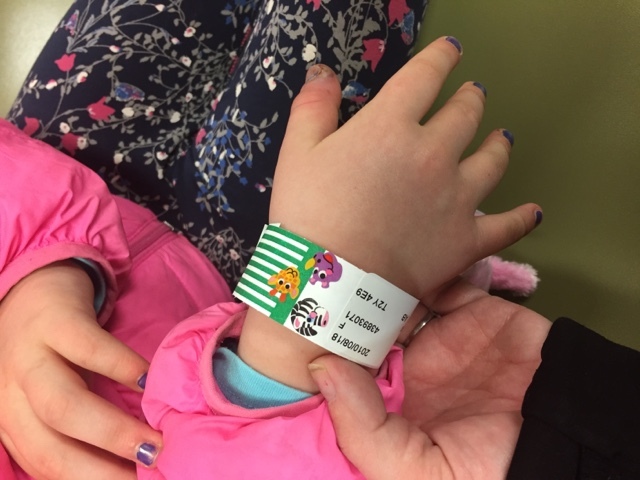 The admitting nurse was fantastic and got Penelope some stickers to put on her wrist band to help calm her fears. And best of all, there was a giraffe on it. We barely sat back down before we were whisked to the back and put in a room to see a doctor. So Penelope had a abscess on her thumb, which they popped with something sharp and drained it all out. It hurt immensely and she cried a little when this was happening but the relief on her face once it was all over and all the pressure was released was good to see. She also had cellutlitis which is infection of the skin and was given antibiotics to help kill the infection. As long as the cellulitis didn't spread, we were good. And as I write this on Monday morning, nothing has spread. They wrapped it up in a nice bandaid for her and she was so happy to be pain free and going home. It was still tender on Friday but it was feeling so much better on Saturday. She took the band aid off on Saturday and had a shower and once it all got cleaned off, it looked so much better. The best part was able to sleep through the night for the first time in 2 days. I was exhausted and so was Penelope. Finley somehow managed to sleep through it all. 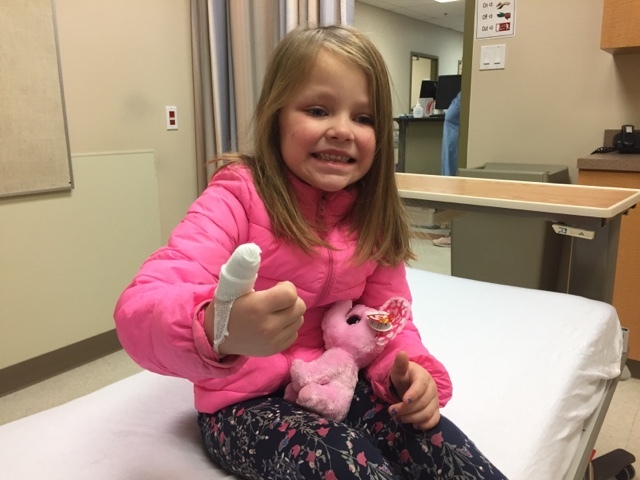 Penelope was happy to get back to school today and her thumb was doing so much better and we are out of any danger zone of it spreading up her arm and turning it into something far worse. I am extremely grateful for our health care system that is for sure.